Surrey-based Silent Pool Distillers has created what is thought to be the world’s largest and most expensive bottle of gin, costing £5,000. Also touted as the world’s only nine-litre bottle of gin, the record-breaking vessel will go on show at Hedonism Wines in Mayfair, London, on 10 March. It has been hand painted and signed by artist Laura Barrett and contains the 24-botanical Silent Pool Gin, which was launched last November after “years of research and trials”. 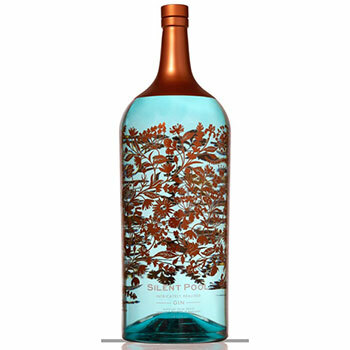 Silent Pool Distillers is based on the Albury Estate, in Surrey, UK, and takes its name from a nearby pair of ancient pools in the Surrey Hills. The design of the bottle is said to be inspired by ingredients of the gin, the area in which it is created, as well as local mythology. Legend has it that back in the 13th Century, a beautiful young woman was bathing in the pools when she was drowned by the evil Prince John, brother of King Richard. She is now thought to haunt the lake at midnight. Silent Pool Gin contains botanicals such as Bosnian juniper, Bulgarian angelica, honey and grain of paradise. The distillery treats its botanicals in two different ways: some are bruised and macerated in the base spirit for a period of 24 hours before being transferred to the still, while others are macerated in a higher proof spirit and then filtered out, leaving only the oils and aromatic compounds to be added to the distillation. The nine-litre bottle of Silent Pool is now said to be the world’s most expensive bottle of gin, taking the title from Cambridge Distillery’s Watenshi Gin, which costs £2,000. However, Watenshi Gin is a standard size bottle, as opposed to a larger format. Launched exclusively with Selfridges, Watenshi Gin has been created by capturing the evaporation, known in the industry as angel’s share, of Cambridge Distillery’s Japanese Gin. Using a “refined technique”, William Lowe, master distiller at Cambridge Distillery, captures the “top 1%” of the award-winning Japanese Gin, yielding just 15ml per distillation. Around 50 distillations are required to make one bottle. The Spirits Business awarded Watenshi Gin the top spot in its list of most innovative spirits launches of 2015.